Drop Salomon's TNT Ski into the pipe, throw it into some techy trees, or blast it down some groomers. It might be named after a blunt instrument, but the TNT's an all-mountain scalpel that's perfect for teenagers or lighter riders looking for a ski that can make short work of everything the mountain has to offer. Traditional camber underfoot gives the TNT plenty of pop, helps you rail turns, and lets you carve into takeoffs, while the lightweight wood core holds the swing weight down for easy spinning and keeps the flex manageable for skiers who don't weigh as much as an East German wrestler. Even though it's light and nimble, the TNT can rip. 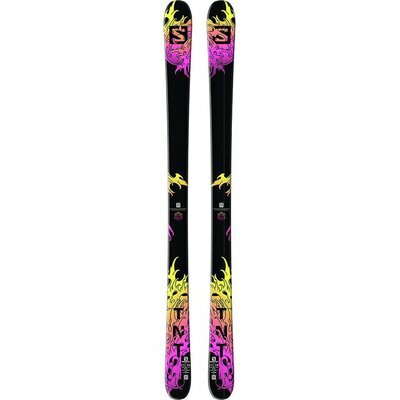 Salomon covered up the wood core with a Titanal laminate, which adds plenty of backbone for high-speed skiing, and it finished the ski with an Edgy Monocoque cap construction, which combines weight savings with torsional rigidity for reliable edging and powerful turns. The steel edges bite into hardpack, and their XL burliness can stand up to rocks, rails, and urban shenanigans.